Lightspeed Systems Smart Play opens access to an education-friendly database of video content while blocking inappropriate videos. 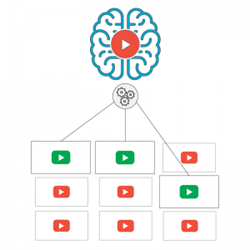 Smart Play utilizes machine-learning technology and artificial intelligence to analyze video content and make an unrivaled selection of educational videos available to students. Lightspeed Systems Smart Play — an innovative new tool to ease YouTube video streaming in K-12 schools — achieved a milestone today when its database grew to 40 million educational videos. Launched in summer 2017, Smart Play is a proprietary technology from education technology company Lightspeed Systems that opens educationally valuable YouTube videos to students while protecting them from explicit, inappropriate content. Founded in 1999, Lightspeed Systems has been trusted by thousands of schools around the world to make student devices safe, filtered and easily managed. Recognizing that YouTube presents many educational opportunities for students as well as many unsafe videos that violate Children’s Internet Protection Act (CIPA) standards, Lightspeed Systems developed Smart Play as a feature to the Lightspeed Systems Web Filter and Lightspeed Systems Relay. Smart Play utilizes machine-learning technology and artificial intelligence to analyze video content and make an unrivaled selection of educational videos available to students. Graphic and inappropriate videos — as well as thumbnails of those videos— are blocked by the solution. Best of all, IT administrators using Web Filter or Relay can enable this revolutionary new tool with just one click in the solution’s interface. At the time of launch in June 2017, Smart Play’s database included 26 million videos. Its database has expanded to 40 million videos — a growth of almost 54 percent in seven months — thanks to Lightspeed’s innovative proprietary technology. Each day, Smart Play’s database will continue to grow by hundreds of thousands of new videos that are appropriate for student consumption. To learn more about Lightspeed Systems Smart Play, visit http://www.lightspeedsystems.com/smart-play. Lightspeed Systems partners with schools to make learning safe, mobile and easily managed. Partnered with 6,500 districts in the United States and 25,000 schools around the world, Lightspeed Systems offers integrated solutions for smarter K-12 school networks: Web Filter, Relay, Mobile Manager, and Management Bundle for Windows. To learn more, visit http://www.lightspeedsystems.com.